Peter commenced part-time work with CeRDI in 2018, assisting in updating the historical data on the Natural Resource Management Planning Portal for the Corangamite region. 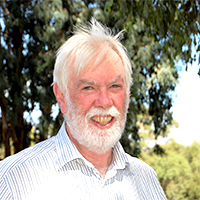 Peter's career spans over 40 years, having worked for the Victorian government and Corangamite Catchment Management Authority in various roles. Peter has worked in many senior management roles during that time and is a respected professional who has extensive networks in the environmental, sustainability, social and natural resource management industries, from grassroots to all levels of government. Peter has been involved in a number of projects during his career, invited on a number of panels including Melbourne Water's Expert Input Panel on River Health, and managed and co-authored the Corangamite Community Strategy for the Corangamite Catchment Management Authority. Peter has worked closely with CeRDI during his career, assisting with the initial establishment of the Corangamite Catchment Management Authority Knowledge Base, salinity, groundwater and soils projects. Peter is well known for his community engagement, catchment and resource management knowledge. Peter has and continues to be heavily involved in community projects, currently Secretary of the Rotary Club of Grovedale Waurn Ponds, board member of the Geelong Region Local Learning and Employment Network and undertaking a mentoring role with the Victorian Police as part of a partnership with Rotary and Victoria Police. Peter has completed a Bachelor of Applied Science (1987) and a Diploma of Business Management (2009). Harrison, B. (South West Pest Plants and Animals Team, DNRE); Missen, R; Barber, C; Bingley, T; Codd, P; Tesselaar, K; Cosgriff, M; Corangamite Rabbit Action Plan 2001-2006 (2000); Corangamite Catchment Management Authority. Harrison B (Harrison and South West Pest Plants and Animals Team, NRE) with assistance from, Missen R (Corangamite Catchment Management Authority), Barber C (Corangamite Catchment Management Authority), Bingley T (Corangamite Catchment Management Authority), Codd P (Corangamite Catchment Management Authority), Tesselaar K (Corangamite Catchment Management Authority); 1999; Corangamite Rabbit Action Plan: Strategic Rabbit Management 1998/99 - 2002/03, Corangamite Catchment Management Authority. Codd P; 1992 The Environmental Conditions of Waterways and Wetlands in the Corangamite Salinity Region, Victoria, Department of Conservation and Natural Resources. 2018 State Panel member for the Victorian Government's Environmental Volunteering Plan, Expert Group. 2017 State Panel member for the assessment of the Victorian Government's Plowman Award as part of the State Landcare Awards. 2017 State Panel member, Victorian Governments Biodiversity On-Ground Action (BOA) Biodiversity Hubs Projects. 2017 State Chair Assessment Panel for the Victorian Government's Port Phillip Bay Fund. 2011 Panel member Melbourne Water's Expert Input Panel on River Health. 2008 Invited speaker at the National Natural Resource Management Conference in Melbourne on the benefits for Corangamite in undertaking our Regional Knowledge Strategy; Australia (Land and Water Australia). 2007 Invited speaker at the NRM Facilitators Workshop, Canberra, and Topic 'Statutory Planning - A continued investment in environmental protection'. 2006 Invited presenter to the Nth Australian Natural Resource Management Forum, 'Crossing boundaries... Building NRM investment', Darwin, NT; May 2006 'Building Community Capacity'. 2006 Invited presenter to the CSIRO 'Volunteerism, Democracy, Administration and the Evolution of Future Landscapes', Workshop - April 2006; Perth, Australia. 2005 Invited presenter by Land and Water Australia to the Outlook Conference, March 2005 Presentation titled 'A case study - using science to achieve catchment targets'; Canberra. 2003 Invited to present to the Western Australian Natural Heritage Trust, Targets Workshop, Perth, February 2003.